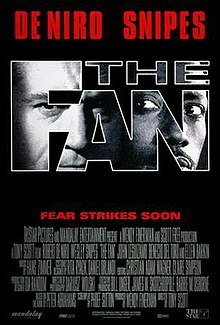 The Fan is a 1996 American sports psychological thriller film directed by Tony Scott, and starring Robert De Niro and Wesley Snipes, based on the novel by Peter Abrahams. Gil Renard is a divorced knife salesman, estranged from his son. He is also on the verge of losing his job due to poor sales, and that his boss, Garrity, does not appreciate him as much as he used to. His favorite sport is baseball, and his favorite team is the San Francisco Giants, after his favorite player, Bobby Rayburn, had signed a $40 million dollar contract with the team. His ex-wife Ellen obtains a restraining order to keep him away from herself and their son when Gil left his son to attend a sales meeting, but finds his client is at the baseball game. Gil is fired from his job when he threatens a prospective customer. Gil is a fan of the San Francisco Giants, and he is obsessed with their newest player, Bobby Rayburn. Rayburn suffers a chest injury that causes fans to be upset by his under performance, causing Gil to show aggression to fans that jeer Rayburn. Rayburn is seen fighting with teammate Juan Primo in the restroom of a bar, thinking that Primo is to blame for his performance, after which Gil confronts Primo in a hotel sauna, and stabs him to death. Although Rayburn is suspected of the death, his performance improves, and Gil believes that what he did was good for Rayburn and the team. After feeling guilty about Primo's death, Rayburn starts playing well again. Gil is thinking that Rayburn does not acknowledge his fans much. Gil goes to Rayburn's beach house and saves Rayburn's son from drowning. Gil persuades Rayburn to play a friendly game of catch on the beach. Rayburn says he stopped caring about the game after Primo's death, because he felt there were more important things in life. He makes the mistake of telling Gil that he has lost respect for the fans, remarking on their fickle nature — when he's hitting, they love him, but when he's not, they hate him. Gil's temper rises as he almost hits Rayburn with a fastball, and launches into a diatribe. Rayburn is slightly disturbed, especially when Gil takes off his jacket to reveal Rayburn's jersey underneath and wonders if Rayburn is happy that Primo's not around. Rayburn soon discovers that his son has been kidnapped by Gil. He finds a piece of Primo's branded shoulder in the freezer. Disillusioned with Rayburn's disrespect towards the fans, Gil spirals further into insanity. He acts as though Sean is his own son. He drives to see an old friend, Coop, a catcher that Gil spoke often of playing baseball with in his past. Coop tries to help Sean escape, and reveals that the only time he and Gil ever played together was in the Little League. Gil then beats Coop to death with a baseball bat, and takes Sean to a baseball field, hiding him there. He contacts Rayburn to make one demand: hit a home run in the upcoming game and dedicate it to Gil, or he will kill his son. With the police on high alert, Gil enters Candlestick Park in the midst of an on-and-off thunderstorm. Rayburn struggles with his emotions while at bat. After several pitches, he finally hits the ball deep into the outfield but not over the fence. Rayburn attempts to score an inside-the-park home run. He is called out, even though he is obviously safe. Rayburn argues with the umpire, who turns out to be Gil in disguise. Rayburn knocks Gil to the ground. Dozens of cops swarm onto the field and confront Gil. Before the cops arrive, Gil kills another player, Lanz, who tries to tackle him. Despite warnings from the police, Gil goes into an exaggerated pitching motion with a knife in hand. He asks Rayburn if he cares about baseball, then realises that he cares "just a little bit." Gil is shot dead as he is about to throw the knife. Police discover Sean at the Little League baseball field, where Gil once played in his childhood. They uncover his obsession with Rayburn, as hundreds of newspaper clippings adorn the deranged fan's hideout. A picture on the wall shows Gil in his past glory, playing Little League baseball and winning a game. Don S. Davis as Stook, Giants' manager. The Fan received mixed reviews from critics, as it holds a 34% rating on Rotten Tomatoes based on 29 reviews. The film brought in $18,626,419 in the United States and Canada. The opening weekend brought in $6,271,406 and then dropped down 47.2% the subsequent weekend. This page was last edited on 21 April 2019, at 19:04 (UTC).